The SUSSEX single light pendant features a black finish with a metal shade. Adjustable height to fit your dicor needs. This fixture comes with an integrated LED that saves energy and lasts a long time. It is perfect for the dining room, kitchen island, restaurants, and many other applications. The Gama Sonic Triple Tier GS-126W solar light fixture is a modern outdoor LED wall light. The rust-resistant cast-aluminum light fixture sports a matte white powder-coated finish. Its circular wall bracket, measuring 5.5 inches in diameter, mounts easily on any surface, and no electrical wiring is required. The internal Lithium Ion battery pack charges when sunlight hits the fixture's integrated monocrystalline silicon solar panel. The fixture is designed to provide 70 lumens of light from dusk to dawn when the battery gets fully charged by a days worth of sunlight. Extra benefits include panel protection with durable tempered glass and a battery pack that should last for about 1,000 charges. For any product questions or unexpected issues, Gama Sonic support at our Atlanta headquarters is here to help. The Round 14in. is ideal for use in foyers, corridors, kitchens, stairways, Libraries and many other light commercial or residential settings. The Lacuna features a solid brushed aluminum exterior with a matte white acrylic diffuser. This fixture can be left on for 24/7 operations. Produces 1400 lumens at 50,000 hours of life. 4 ft. 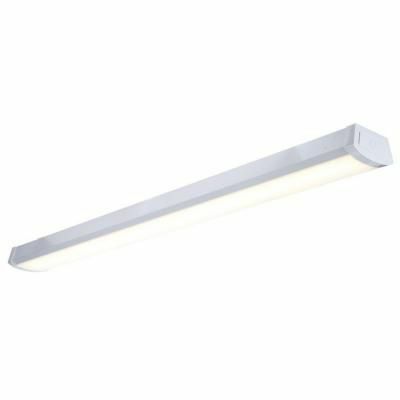 LED Wraparound Light Fixture - ENERGY STAR® is rated 3.9 out of 5 by 14. Rated 5 out of 5 by DannyL from Great !! I bought the 4 ft LED Wraparound light fixtures and really happy with the quality. Rated 2 out of 5 by cgymike from Lamp is pretty Good The only problem is you can't buy parts for them. I broke the diffuser first day, and if you can find someone willing to sell you one it is $75 just for shipping. They need to start stocking diffusers for these lamps. Can we purchase the plastic defusser separately for these lights. Of the three lights we purchased two of the plastic defussers cracked when we installed them. Seriously disappointed with such poor quality. Please help me. Yes the diffuser's have been improved and are available . Is this fixture DLC certified? The only sticker on mine is a UL sticker. What happens when the bulbs or whatever burn out, does the whole unit have to be tossed? The short answer is yes. ☹️ But...if your versatile and a bit handy with a soldering iron and you want to save the housing, look up an LED lighting store on the internet and order the parts that no longer work. They offer LED strips on various lengths as well as drivers and other parts. By the time you need a replacement though (say 20 years from now), I'm guessing you might as well toss it and buy a replacement unit because you'll save very little cash, if any. Can this LED wraparound be used with a dimmer switch (a dimmer that is made to work with LED's)?